Kathleen “Kate” Susan Shane wore many hats in her time here with us. She was a beloved daughter, mother, sister, and friend. But also a coach, an unofficial cheerleader for her loved ones, and a teacher. It was always easy to feel her presence when she entered a room. Kate was born on September 28, 1960 in Kalamazoo, Michigan to parents Shirley (Manes) and Charles Shane. She was the fifth of seven children and a blessing to the already close-knit family. She attended Portage Public Schools for her early education, graduating from Portage Northern High School where she excelled on the swimming and diving team. Kate held a school diving record all the way up until 2009. Kate later attended Western Michigan University where she received her BS and MA in Behavioral Psychology while continuing her career as a springboard diver. She worked in many settings including KRESA, Allegan RESA, St. Joseph ISD, Woods Edge Learning Center, and Croyden School. At Croyden, Kate played a major role in helping to create the early behavioral intervention classroom for children with autism. She was a gifted behavioral specialist whose talent with children was incredible. She made a positive difference in many lives. Kate also lent her talents to those around her, coaching Kalamazoo Central High School’s Swimming and Diving Team and later on both Portage Northern and Portage Central’s. In October of 1994 Kate and her then husband Michael Timmons welcomed a baby girl named Casey. She was a loving and involved mother, and anyone who knew her could tell how much she cared for her daughter. A close second to Casey in her heart was her dog Ziggy, who joined the family in 2010. Kate and Ziggy were quite the dynamic duo. The two would visit the Heritage Living Community weekly to put on a show for their many residents. This brought much joy not only to the residents but to Kate and Ziggy as well. Kate found many friends through organizations and clubs throughout the years. She was a member of Breakfast Optimist Club of Kalamazoo, St. Thomas Moore Parish, and Trout Unlimited (where she would meet her sweetie Greg). Her love of fishing was shared with Greg who tried as best he could to keep up with her. Kate’s battle against breast cancer spanned nearly a decade, and included multiple diagnoses and periods of remission. Through it all, her fighting spirit never left her. “Quitting” was not in her vocabulary. Her courage and hope were contagious to those around her, including patients and doctors alike. Fellow cancer patients would often know her and her dog by name. Although the disease was present in much of her daily life, she refused to let it define her. 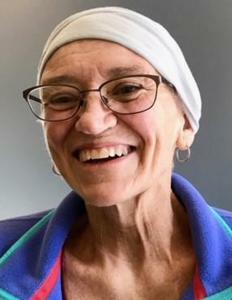 Kate passed away November 12, 2017, at Rose Arbor Hospice in Kalamazoo, MI. Her battle with cancer and pain are completed; her new life in heaven has just begun. Kate is survived by her daughter, Casey Timmons, her mother, Shirley Shane, six brothers and sisters:Mary Bellinger, Jean, Michael (Terrence Jezowski), John (Brenda), Charlie (Teri), Rick (Terri) Shane and several nieces, nephews and cousins. She was preceded in death by her father, Chuck Shane. Visit with her family and friends on Thursday (Nov. 16) from 4-7pm at the Betzler Life Story Funeral Home, 6080 Stadium Drive; Kalamazoo (269) 375-2900. Mass of Christian Burial will be celebrated at 11am on Friday at St. Catherine of Siena Catholic Church, 1150 West Centre, Portage. Please visit Kate’s personal web page at www.BetzlerFuneralHome.com, where you can archive a favorite memory or photo and sign her online guestbook.